Samuel " Joe the Plumber" Wurzelbacher is drawing scorn from far outside of the northern Ohio district where he's running for Congress after posting a campaign video this week that ties the causes of the Holocaust and Armenian genocide to gun control. "In 1911 Turkey established gun control; from 1915 to 1917 1.5 million Armenians, unable to defend themselves, were exterminated," Wurzelbacher, who is running for the U.S. House, says in the web video while pulverizing fruits and vegetables with blasts from his shotgun. "In 1939 Germany established gun control; from 1939 to 1945 6 million Jews, 7 million others, unable to defend themselves, were exterminated," he continues, before turning to the camera and announcing "I love America." The National Jewish Democratic Council quickly condemned the video and demanded Wurzelbacher apologize and remove the ad, which the group's president and CEO David Harris said shows has a "tremendous lack of respect" for the millions who died in the Holocaust and Armenian genocide. "It is not acceptable ever to invoke the holocaust to make a political point," he said. "To say it does a disservice to those who perished and the memory of the Holocaust is putting it mildly." But Wurzelbacher said that he was merely stating historical facts and insisted "there is nothing offensive about it at all. " "I'm not saying gun control was causing the Holocaust in any shape or form and the people who are saying that are motivated by petty partisan poltiics," he told ABC News. "I believe ultimately the left, they hate history." Wurzelbacher took to Twitter Tuesday to defend the video, tweeting that "No one in the video said gun control CAUSED genocide" and aimed to justify the video, tweeting "Hitler wrote in Mein Kampf that his agenda would not be possible unless the people were disarmed." Wurzelbacher is no stranger to the national spotlight. 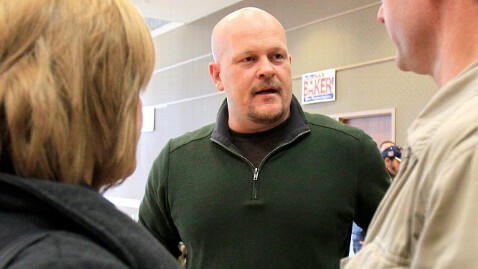 He gained nationwide notoriety as "Joe the Plumber" during the 2008 presidential race after Sen. John McCain's campaign used Wurzelbacher as the poster child for the negative impacts of Barack Obama's tax plan, which would have increased taxes on Wurzelbacher's plumbing business. Wurzelbacher is challenging Democratic incumbent Rep. Marcy Kaptur, who has served for 15 terms, for her seat in the U.S. House seat. The title of this post was changed and the text was updated at 2 PM to include Wurzelbacher's comments.